If a timber suspended floor, check to see if the floorboards are tongued and grooved by inserting a thin bladed knife between the joints. If the knife goes all the way through, the floorboard joints will be square edged and should be sealed with our Acoustic Sealant (optional extra) before commencing with the rest of these instructions. Using our supplied special aerosol contact adhesive, bond the 2mm SBM5 soundproofing mat to the floor(Timber suspended floors only). The adhesive has an adjustable nozzle so it is usually better to select the widest spray pattern by turning the nozzle so it aligns with the symbol and usually marked H at one o’clock to the nozzle. The other settings are M and L for medium and low spray pattern. (See application instructions on side of can). Spray the soundproofing mat and then spray an appropriate area on the floor and immediately fix it down taking care to position it correctly. Continue to install the soundproofing mats across the entire floor surface wall to wall ensuring the edges are tightly butted together. If gaps occur they can be filled with our Acoustic Sealant but should they should be kept as small as possible. If a permanent fixing of this layer of soundproofing mat is not desired onto a timber suspended floor, then it can be nailed down with felt nails. 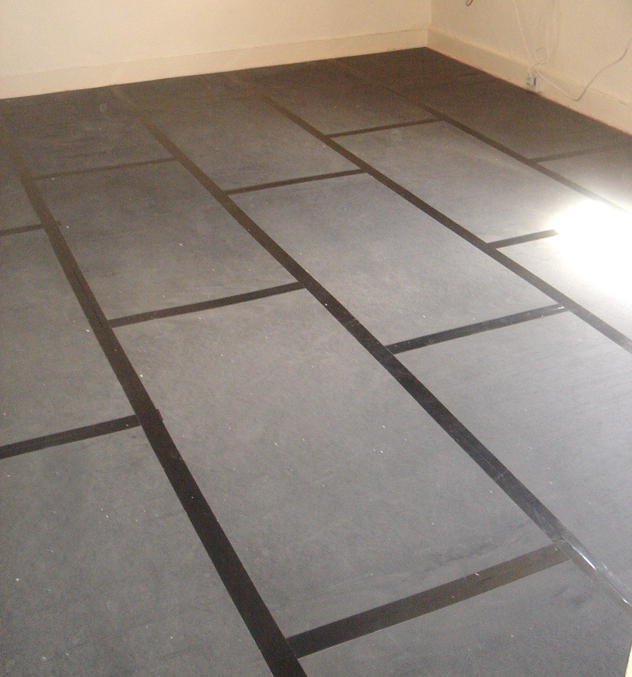 Nail the QuietFloor Plus edging strips (Supplied) around the perimeter of the room. These are packing pieces for the carpet grippers to ensure they will be at the correct height after the QuietFloor Plus has been installed. If it is a concrete floor masonry nails will be required. Now install the QuietFloor PLUS acoustic underlay and it is best to install these in a brick pattern across the floor wall to wall and can be glued down if preferred using the adhesive already described. Although these panels are die-cut, due to the flexibility and thickness of the acoustic foam, slight variations in the dimensions of this product can occur. If this is evident it may be better to not install in the more normal brick pattern, but install in rows with straight joints instead. Ensure the joints of the QuietFloor PLUS are tightly butted to one another then secure the joints using our Jointing Tape before the carpet is installed. It is important to use the Jointing Tape because joints that are not tightly butted will allow noise leakage and reduce the effectiveness of the product. 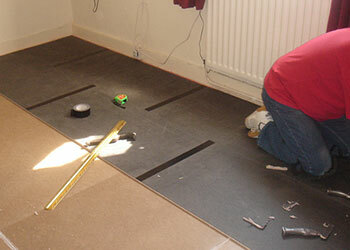 No additional underlay is required, the carpet can be installed directly onto the newly laid acoustic underlay. It may be preferred to use a carpet fitter to install this insulation although it can be undertaken by any DIY orientated person. Although every effort is made to ensure this product leaves us in perfect condition, sometimes slightly inferior Quietfloor PLUS panels can be packed in error. Should any of these be received, they can usually be used for cutting in around the edges of the floor leaving the damaged or sub-standard section as waste. This work can easily be undertaken with the minimum of tools. The main tool required will be a craft knife with a sharp blade although you may prefer to use an experienced floor covering fitter to undertake the work.